Eileen Fisher slubby linen-blend tunic, available in your choice of color. Caroline Rose classic linen two-pocket half sleeve tunic. Boat neckline. Half sleeves. Front patch pockets. Split hem hits thigh. Inverted back pleat. Relaxed fit. Linen. Dry clean. Made in USA of imported material. Model's measurements: Height 5'10"/177cm, bust 33"/84cm, waist 25.6"/65.2cm, hips 35.8"/91cm, dress size US 2-4/FR 34-36. Caroline Rose tunic in lightweight, breathable linen knit. Boat neckline. Three-quarter sleeves. Easy-fitting A-line silhouette. Sweeping high-low hem. Pullover style. Caroline Rose tunic in lightweight, breathable linen knit. Boat neckline. Three-quarter sleeves. Easy-fitting A-line silhouette. Sweeping high-low hem. Pullover style. Linen. Hand wash. Made in USA of imported material. Model's measurements: Height 5'10"/177cm, bust 33"/84cm, waist 25.6"/65.2cm, hips 35.8"/91cm, dress size US 2-4/FR 34-36. Derek Lam blouse in silk chiffon. Crew neckline; button keyhole back. Long split sleeves. Self-tie at back. Relaxed fit. Hem hits below hips. Slipover style. Silk. Made in Italy. Model's measurements: Height 5'10"/177cm, bust 31"/79cm, waist 24"/61cm, hips 34"/86cm, dress size US 0/2. 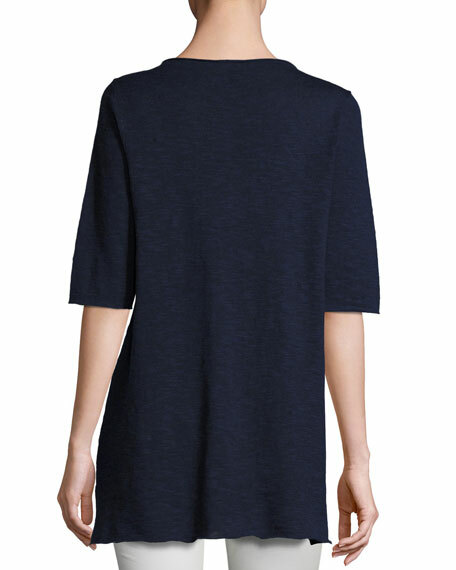 Eileen Fisher layered stretch-silk jersey tunic, available in your choice of color. Bateau neckline. Long sleeves. Relaxed silhouette. Asymmetric sheer hem. Pullover style. Silk. Dry clean; light steam press; do not over press. Imported. Model's measurements: Height 5'10"/177cm, bust 33"/84cm, waist 25.6"/65.2cm, hips 35.8"/91cm, dress size US 2-4/FR 34-36.